0 to 10 Sandpaper numbers. 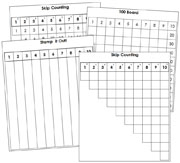 11 Charts & lessons to solidify the concepts of numerical order, quantity, association of numbers and quantities, and skip counting. 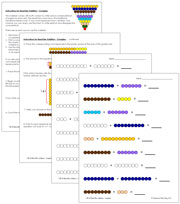 45 Complex addition equations for the colored bead bars. 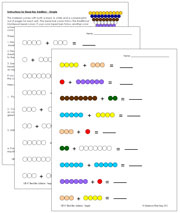 45 Simple addition equations for the colored bead bars. 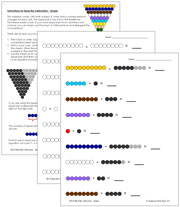 54 Simple subtraction equations for the colored bead bars. 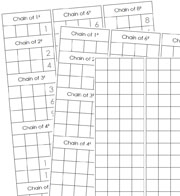 Notation paper for the square chains. 3-Part cards for Canadian coins and bills. 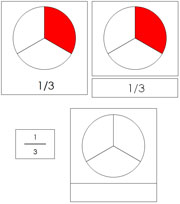 3-Part cards (color-coded) for learning to tell time. 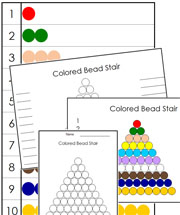 Extension lesson for the Montessori colored beads. Labels for the Cube Chains (1³-10³).